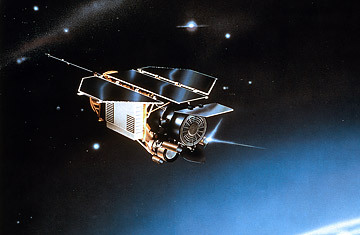 An artist impression of the ROSAT satellite in space. The problem comes when two objects in effect change lanes  descending to a lower orbit (which requires slowing down) or climbing to a higher one (which calls for speeding up). That's the equivalent of cars merging badly on a freeway  with similarly messy results. Even worse is when two vehicles flying in different orbital planes  or inclinations to the equator  collide. The U.S. launches most of its spacecraft at a 28.5-degree inclination in order to ensure that the ships fly over the U.S. land mass; the Russians fly mostly at 51.6 degrees so that they cover their own home turf the same way. The 2009 accident was a demonstration of what happens when the two planes cross. While it's relatively easy to track big pieces of debris, small ones  as small as a grain of sand  can do their own kind of damage, since the speed at which they travel increases the energy they pack all out of proportion to their size. The ISS was built of different airtight compartments mostly because that was the easiest way to get all of the components to orbit, but the various nodes do serve as individual panic rooms into which astronauts could retreat if a high-speed space grain penetrated the hull of one of the other compartments, causing it to depressurize. No one on the ground need to worry about the small stuff  or even the medium or relatively big stuff  since the earth's atmosphere sees to it that most debris is incinerated well before it reaches the surface. But if the re-entering vehicle is too big, the atmosphere can't vaporize it all  as happened when chunks of NASA's Skylab crashed into the Australian outback in July of 1979. What's more, some parts of some ships are resistant to the flames of re-entry  one of the concerns about the faltering German satellite, which includes heavy, heat-resistant glass and ceramic that were used, in part, to construct its mirror. About 30 such pieces of varying sizes are predicted to make it to the ground. The odds of any one person getting clobbered by the ROSAT ship are considered relatively steep  about 1 in 2,000, compared with 1 in 3,200 for the American satellite that hit the Pacific. Still, that's hardly off the statistical charts. The remedies for all of this are few. Designers can work to build their ships with fewer breakaway parts, which most indeed try to do. Good tracking makes it possible to predict more accurately when a spent satellite will re-enter, and as long as there's some fuel and power aboard (which there often isn't) a safe landing spot somewhere in the ocean can be chosen and targeted. The launch of any spacecraft is a splendid and fiery thing; the end is usually far more ignominious. The trick, at the very least, is to keep it safe. Read about the ISS astronauts and the space debris. Read about scientists finding fewer asteroids than can threaten Earth.